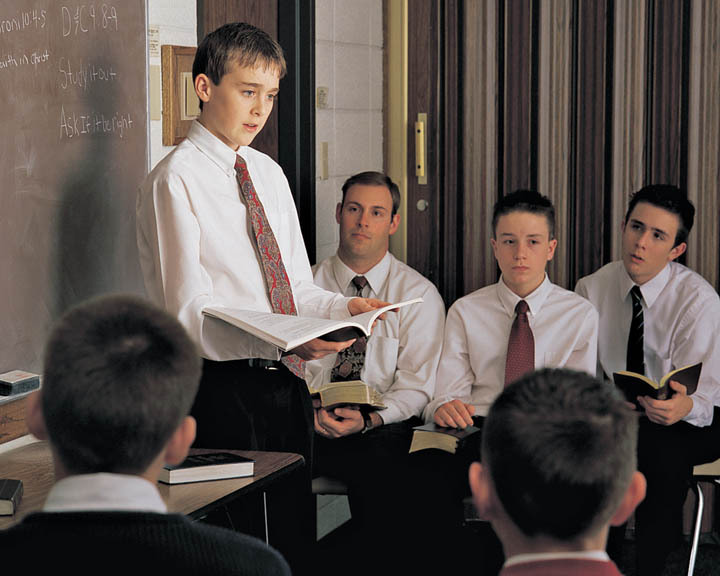 A new Sunday curriculum was announced for Mormon teenagers in October, 2012. This curriculum impacts the Sunday School classes for teens as well as the youth auxiliary classes for teenage boys and girls. Each Sunday, after the basic worship service, Mormons (a nickname for members of The Church of Jesus Christ of Latter-day Saints) stay on for two classes. Children attend the Primary program while teens and adults attend Sunday School classes. Then the teenagers continue on to either Young Men’s or Young Women’s while their parents go to Priesthood or Relief Society. Children remain in the Primary the entire last two sessions. The new curriculum is more flexible, allowing each congregation, called wards, to teach the essential topics in ways that meet the needs of their own youth. Lessons are organized by month, but more lessons are offered than can be taught in that month, so teachers and leaders will select those lessons their students most need. In addition, if a class requires more than one week—for instance, if the lesson ends and students still have questions or concerns—the lesson can continue the following week. Topics will be coordinated between Sunday School and auxiliary classes, providing students with a more in-depth look at the topic. The lessons bring into play the most advanced methods of teaching students. Teachers are given suggestions and reference materials and are expected to prepare for the lesson by studying and building their own testimonies of the topic. At the same time, students are told what their lessons will cover the next week and asked how they intend to prepare for the lesson. This, along with other methodologies, increase student responsibility for learning and also take the lesson outside the classroom. The lesson first summarizes the topic theme, so teachers can stay focused on the actual topic. Next, the teacher is given questions to ponder and a list of references to study that will help her educate herself on the topic and also help her choose materials she feels will benefit her students. The list includes scriptures, recent talks by church leaders, Mormonads (one-page fun pictures that teach an important principle) and a chapter from Preach My Gospel. This last resource is a manual used to prepare teens to serve as volunteer missionaries. The missionary age for both men and women has been lowered, so it is important that they begin preparing while in high school. Then the teacher receives suggestions for teaching the lesson. The class begins by having the girls report on their experiences with last week’s lessons. How did they apply the lesson? What did they learn as they studied further? This helps them see the lessons as relevant to real life, and not just as an academic exercise. Next, the teacher chooses from suggestions for introducing the lesson for this week. One suggestion is to have them complete a self-evaluation found in Preach My Gospel. Another is to have each girl come to the chalkboard to write one aspect of the Savior’s character. They can’t learn to be Christlike until they know what Christ was like. If neither of these seem appropriate, there is a link to other ideas. The girls might study a list of Christlike attributes and choose one they want to work on. They set personal goals and develop a plan to achieve their goal. The girls research the scriptures to learn what Christ was like (which is more effective than having the teacher simply tell them). They can also study one scripture and write about it in their journals. They can think about times when they or others they know were Christlike and discuss how that feels. They study the Mormonads and then create their own. They can study a modern parable and then study scriptures, deciding how the story and scriptures work together. Then they set personal goals and make a plan. All of these methods invite active participation in the learning, rather than listening to a sermon by the teacher. It invites the girls to actually apply the lessons in real life and it also helps them learn how to study the scriptures to find answers. In addition, they gain experience in how to set goals. Finally, the teacher evaluates how well the students have learned the topic and checks to see if they have concerns or questions that weren’t answered. They decide together if they need another week to explore the topic. Then the girls each plan a way to further learn and apply the lesson material in real life. At the end of the lesson, the girls find out what they are studying next week and decide how to best prepare. This allows them to come to class ready to participate. These lessons are very inspired. They help students learn the art of self-directed learning that will show them how to learn the gospel—and anything else—even without a teacher. They learn that knowledge is meaningless unless it is applied. They also learn how to use the scriptures and to see in them messages for modern life.